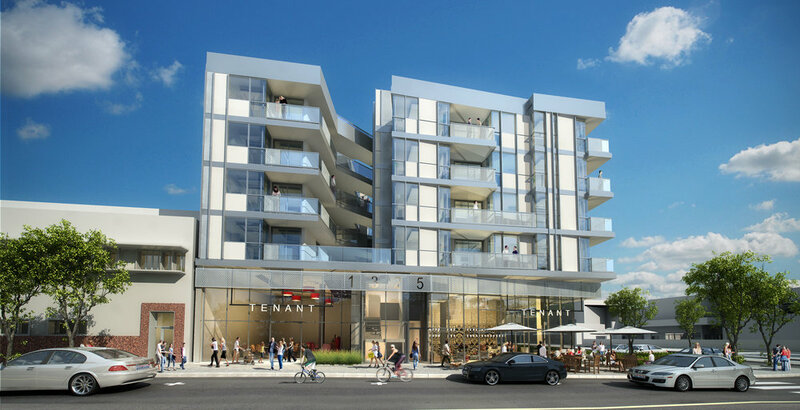 The mixed-use development sits mid block in the Santa Monica Downtown Core. The project is two and a half block from the 4th Street and Colorado Boulevard EXPO Line. Passive solar design strategies were incorporated in the planning process, which lead to a final design to insure natural light and ventilation in the public courtyard spaces and flow through ventilation in the apartment units. A unique massing strategy was adopted that re-interprets the typical building step back required by the zoning code. A vertical slot in the street facing façade design satisfied the zoning code requirements and allowed for natural light and ventilations throughout the central core that is also open to the sky. This move was enhanced and reinforced by an additional vertical slot in the façade that faces the Santa Monica library. This central volume cuts through the entirety of the building, allowing natural light and ventilation to reach all units, making for a much more livable environment. The design focuses on providing natural light and cross ventilation in every unit by optimizing single loaded corridors and eliminating typical double loaded corridors. Along with subterranean parking serving the commercial and residential portions of the building, there are over 100 secured bicycle storage spaces for residents, guests and retail employees. Adjacent to the bicycle storage are bathrooms with lockers, showers, toilets, and sinks. Located on the roof are enough solar collectors to produce the necessary electrical requirements for the public spaces. Roof top solar collectors preheat the water for the hot water boilers accomplishing lower energy costs. The program is composed of approximately 4,800 square feet of ground floor neighborhood serving commercial with 64 high-profile residential housing units above. The design includes a private/public roof deck, a spa with outdoor passive recreational space. The design focused on eliminating double loaded corridors and optimizing single loaded corridors wherever possible. The building’s orientation maximizes the use of natural light while decreasing solar heat gain and minimizing the need for artificial light during day light hours.